The Tel Aviv monument honors the thousands of LGBTQ people persecuted by the Nazis. A Tel Aviv memorial dedicated to LGBTQ Holocaust victims was vandalized this week, The Jerusalem Post reports. 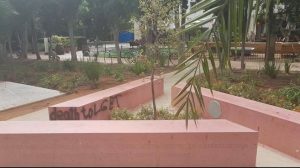 Vandals spray-painted “Death to LGBT” on the memorial, located in Meir Park near the Israeli city’s LGBTQ Community Center. 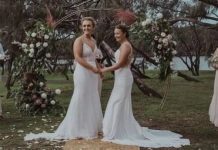 The monument is shaped like a pink triangle, representing the symbol LGBTQ people were forced to wear on their uniforms in concentration camps during World War II. It’s estimated that about 100,000 LGBTQ people were arrested in Nazi Germany, and as many as 15,000 were incarcerated in concentration camps. Passersby discovered the anti-LGBTQ graffiti Thursday morning. The paint was removed shortly after Tel Aviv mayor Ron Huldai publicly denounced the vandalism. “We will continue to act and protect members of the community as we have done so far,” Huldai wrote on Facebook. He later posted a photo showing that the monument had been cleaned. Tel Aviv police have opened an investigation.